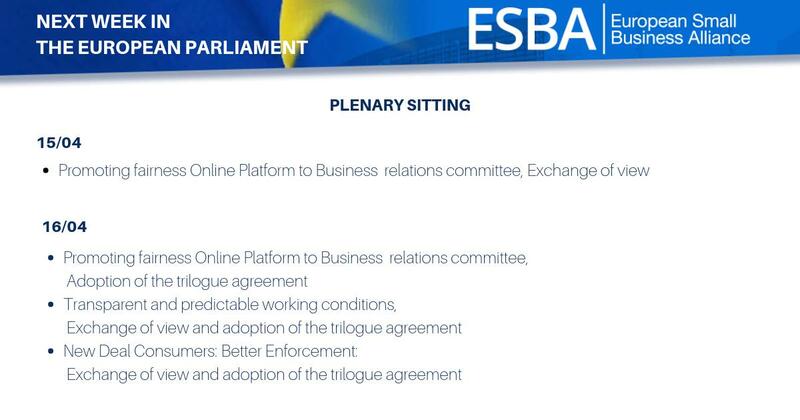 Through its well-established network of key policy-makers, ESBA is in direct contact with Members of the European Parliament, Commission and Council on a regular basis to discuss specific issues in detail and advocate the interests of small businesses throughout Europe. Through a supply and demand of information and knowledge, the main aim of this direct interaction is to gain first hand insight and information for our members on the policy process, as well as to inform the decision-makers as thoroughly as possible on the possible impact on small businesses of the policy proposal at hand, striving for the best possible final legislative outcome. The ESBA Bulletin, a fortnightly electronic newsletter, provides its readers with up-to-date information on all legislative and policy activities of relevance to SMEs as well as information about relevant publications, open consultations and upcoming events. It is distributed to a widespread, diversified and ever-growing readership including key Brussels decision-makers and stakeholders within and beyond the Institutions, as well as the European SME community. Fresh and intuitive in design, the Bulletin focuses on key developments in the EU arena and presents them in a succinct and plain manner. Small businesses throughout the European Union are affected by EU legislation on a daily basis. To be able to respond to the vast number of legislative proposals coming from Brussels, spread over a large number of sectors, it is essential to possess a tool, enabling ESBA to voice its members' concerns and represent their interests promptly and concisely. ESBA position papers are one or two page documents, outlining the core of a legislative proposal, its relevance to small business, as well as its potential pitfalls, and ESBA's recommendations to decision-makers. Position papers form the basis for further dialogue and in-depth discussion with policy makers on how to best shape a policy and ensure it will incorporate the needs of small businesses to the highest possible degree. Social media are increasingly being used as a means of dispersing and sharing information, as well as maintaining a network of stakeholders. In 2009, ESBA established a LinkedIn group, consisting of and open to a wide variety of stakeholders, interested in small business issues. The group serves as a platform for news and discussion, as well as a social and business network. The ESBA issue sheets are reader-friendly documents providing an indepth analysis of the most important policy measures at EU level with regard to SMEs. The issue sheets serve as constantly updated ESBA working documents providing an up to date overview of the development of an EU policy from throughout all stages, enabling both ESBA and its members to easily assess where and when action is needed. Since its establishment in 1998, ESBA has developed a large network of likeminded organisations who oftentimes share similar views on certain topics. By forming single issue ad-hoc coalitions, ESBA is able to increase its reach and form an even stronger voice for small businesses.